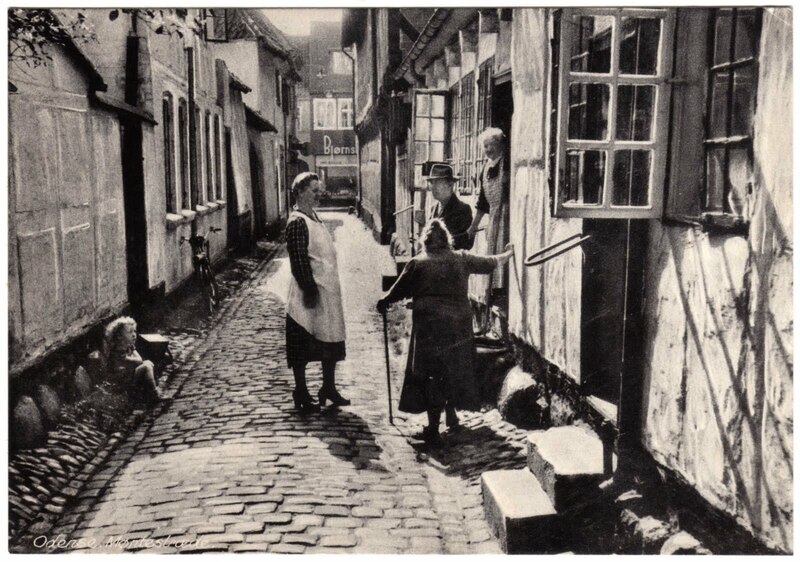 This undated postcard of a street in Odense, Denmark, serves as a nice companion piece to last Saturday's postcard of Fiskargränd in Visby, Sweden. Both are wonderful, human-scale European alleys. Møntergården is an old building adjacent to Møntestræde that housed a coin workshop around 1420. (The building took its name from the street.) The whole area is currently the site of an archaeological excavation. Here's a coin that was found recently at the location. Pernille Lykke bought the site in August 1613 from ... Odense City and in 1617 she had a half-timbered building of 18 bays built in Møntestræde. The original function of the buildings was maintained until 1955, when the institutions became part of the museum complex. The buildings are now furnished to give an impression of how housing conditions were at that time. There is public access to the building. ø -- A Scandinavian letter, it is a vowel and a letter used in the Danish, Faroese and Norwegian languages. æ -- It is a grapheme formed from the letters a and e. It is a letter in the alphabets of some languages, including Danish, Faroese, Norwegian and Icelandic. Pictured at right are both letters as they appear on a Danish computer keyboard. Here's more on the Danish and Norwegian alphabets, if you're interested. 1. Odense is the birthplace of fairy-tale author Hans Christian Andersen and Caroline Wozniacki, who is currently the top-ranked women's tennis player in the world. Ruth Manning-Sanders wrote a biography of Hans Christian Andersen titled "The Story of Hans Andersen: Swan of Denmark". And so I have now successfully written a footnote that legitimately mentions both Ruth Manning-Sanders and Caroline Wozniacki. Just found your blog, and enjoy it! The AE character used to appear in English as well. I can't type the character, but it appeared in such words as EncyclopAEdia, and AEsthetic.